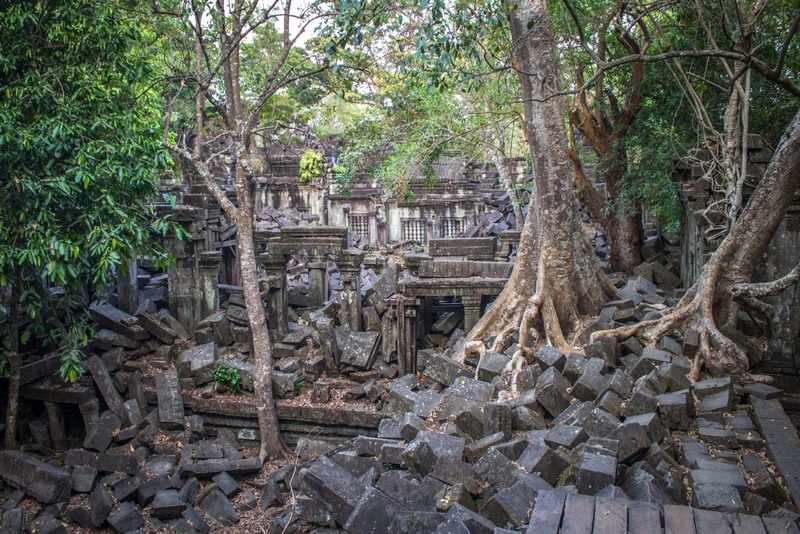 The crowds who come to Cambodia’s Angkor region are spoiled for choice when it comes to temples to visit. Within kilometres of the tourist town of Siem Reap are dozens of sites which can take days to explore. It’s no great surprise that visitors feel there’s enough to see without venturing too far – and fair enough, a lot of these people don’t have much time to spare. But the Angkor region is by far the biggest tourist drawcard in Cambodia and now attracts about two million people a year. So it’s hard to escape the tourist masses and find a site less trodden. 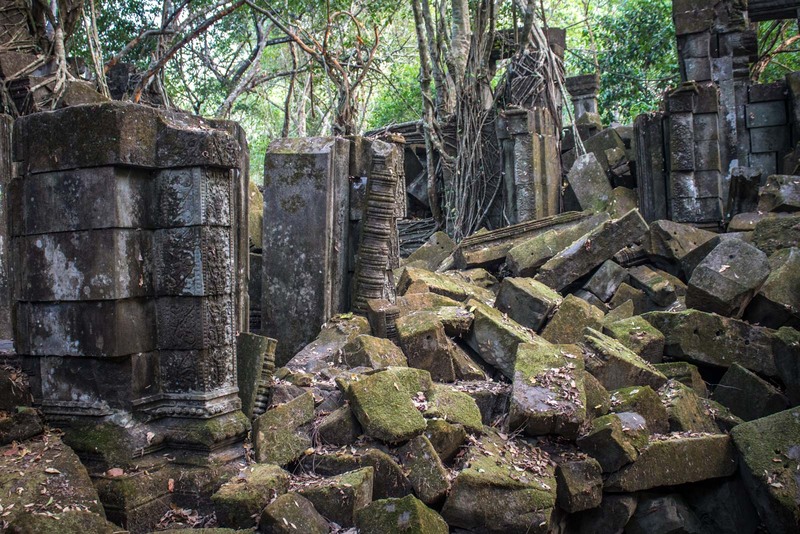 That’s why the trip to Beng Mealea is so worthwhile. I arrive in the late afternoon with a guide and two other tourists. We are literally the only people here. The sun at this time of the day is low in the sky and is casting an orange hue across the land. But the colour is struggling to break through the trees. 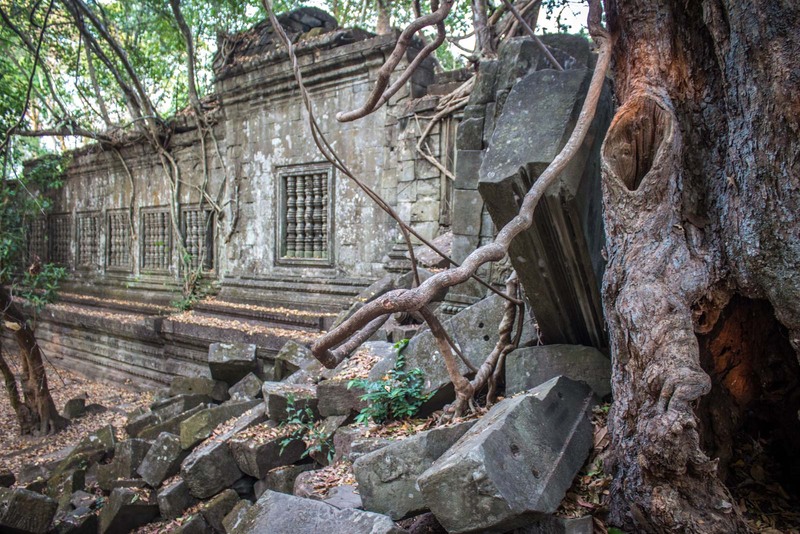 In the years Beng Mealea was abandoned, nature took its course and the whole site has been overrun by plants. 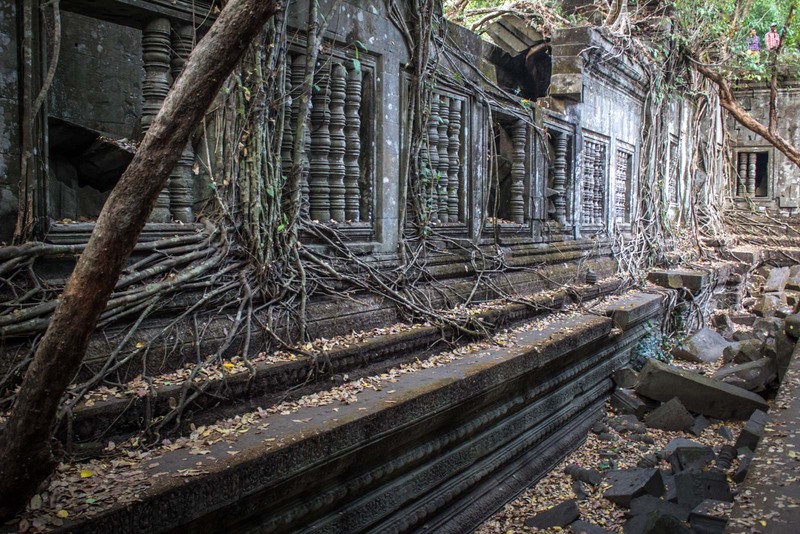 Trees grow out of stone, vines are wrapped around gateways, and roots have stretched through walls. 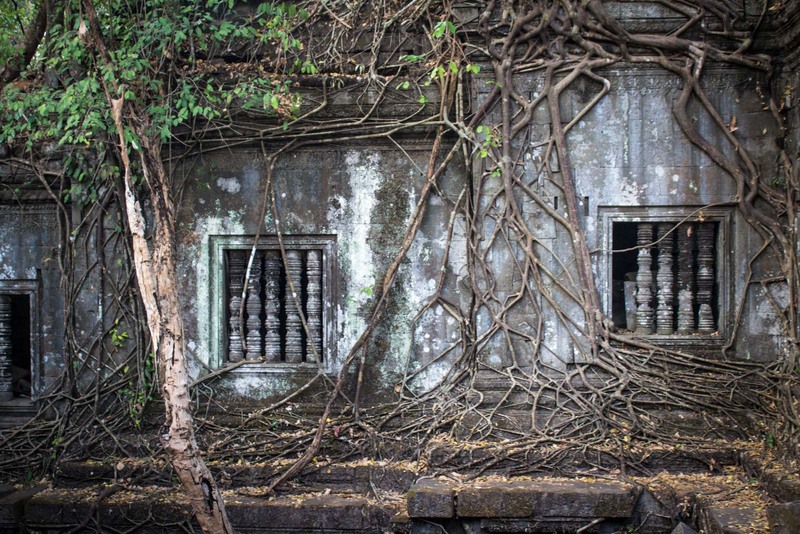 Combined with the parts of the temple which have collapsed from neglect, it creates a sense of romantic rustic ruins. Exploring the site is an adventure in itself. 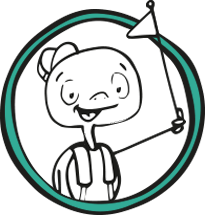 To access the best parts, you need to climb over piles or stones, scramble up walls and swing around trees. This is not Tombraider – this is the real deal. As my guide, San Park, puts it – you need to “rock and roll”. Each new challenge – whether it be clambering up an over a collapsed wall or edging your way along a ledge – reveals a new section of the temple. 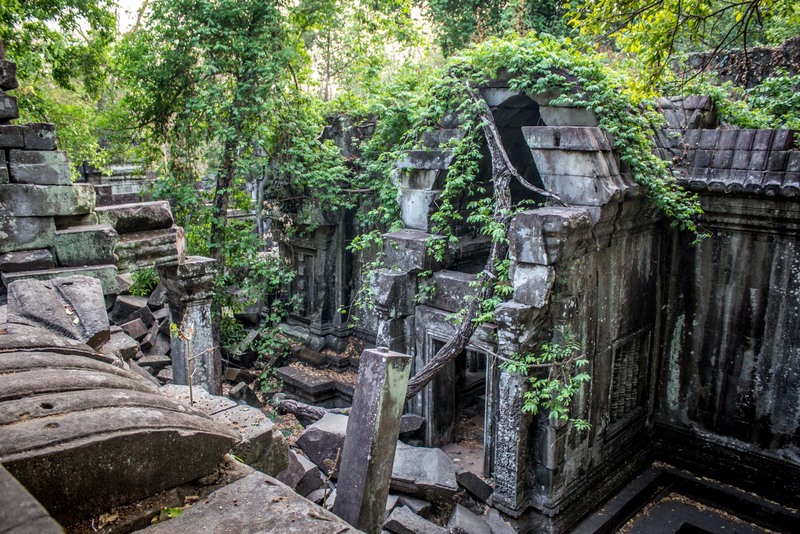 Beng Mealea is as large as the central part of Angkor Wat and is about 200 metres on each side. It’s a large site which seems even bigger when each step needs to be carefully negotiated to prevent a fall. The beauty of dilapidation is the charm of the time spent amongst the trees and the piles of standstone. 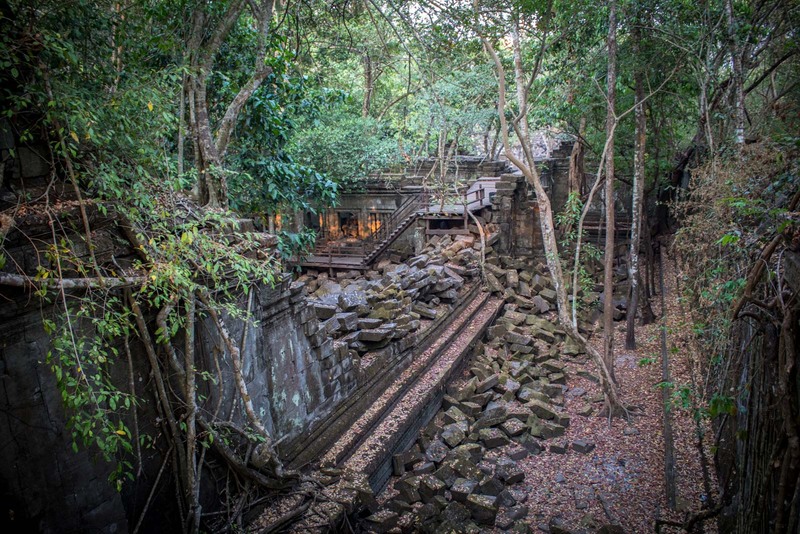 It was not long ago that a new road made Beng Mealea more accessible but it’s still not on the short-term visitor’s radar. Tour buses do come out here in the morning but there is certainly not a regular stream of travellers. It’s without a doubt worth the trip out here, though. The road will almost certainly become more travelled as the temples around Angkor get more and more crowded and the discerning tourist looks for more peaceful alternatives. Where should you stay in Siem Reap? If you’re looking for a budget option, I would suggest the Onederz Hostel which is clean and modern. For something affordable but comfortable, Central Privilege Hotel is a great place. For good value luxury, you should try the Moon Residence and Spa with a pool and large rooms. And if you want to really splurge for somewhere incredible, have a look at Phum Baitang. Amazing that this is so quiet while Angkor Wat is madness! Very cool! Yeah, the difference is unbelievable. It’s definitely worth going to both to get two really different experiences. Looks like fun. 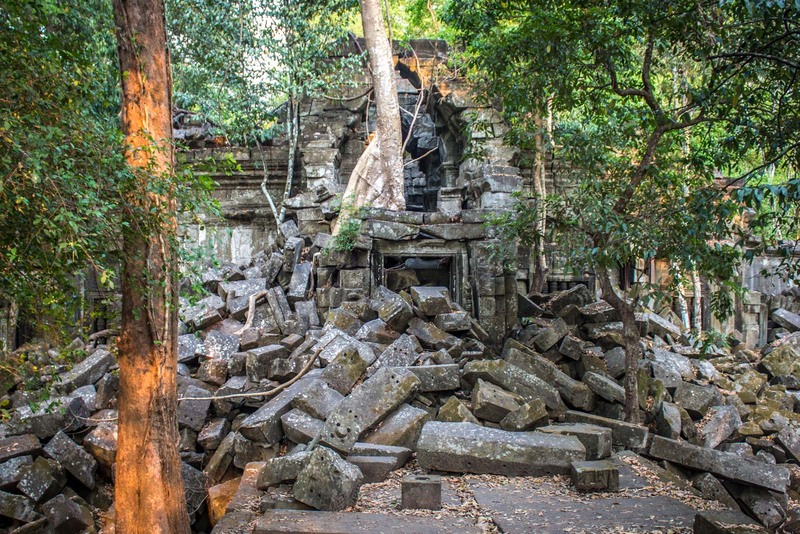 I like the idea that there is this kind of ruins within an hour of Siem Reap. Did you get the tour (car?) from SR? How much did it cost? We are talking about doing a slow round of SE Asia including a week int he area at some point. That should be plenty of time for me to find a group if I can just remember the name from now until then. Cool jaunt, Michale. I was in Siem Reap in April. I found a minibus offering a two-day visit of the temples for $19 and got to see Banteay Srei, Kbal Spean and Beng Melea on the second day. I think the timing was perfect because we arrived at Beng Melea around 3pm with not many tourists there. 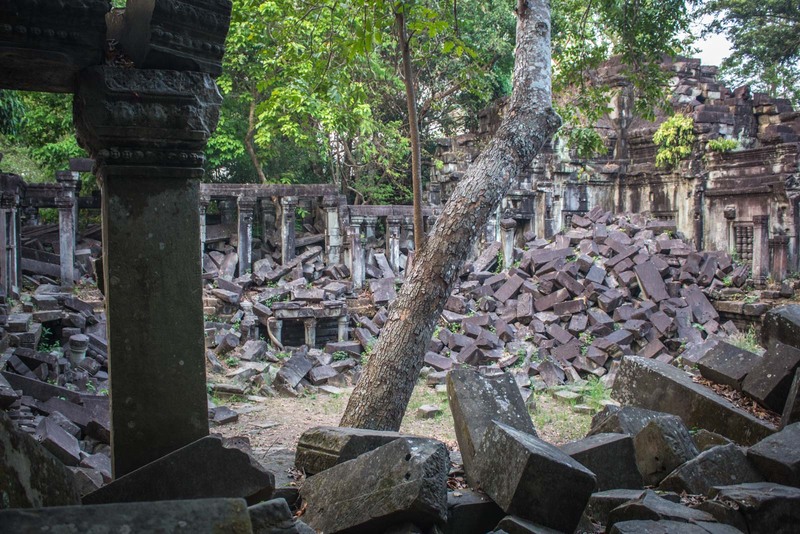 I was so glad to walk around those incredible ruins, it is such a different experience compared to Angkor Wat, Bayon and the temples closer to Siem Reap. Well worth the trip and the extra $5. 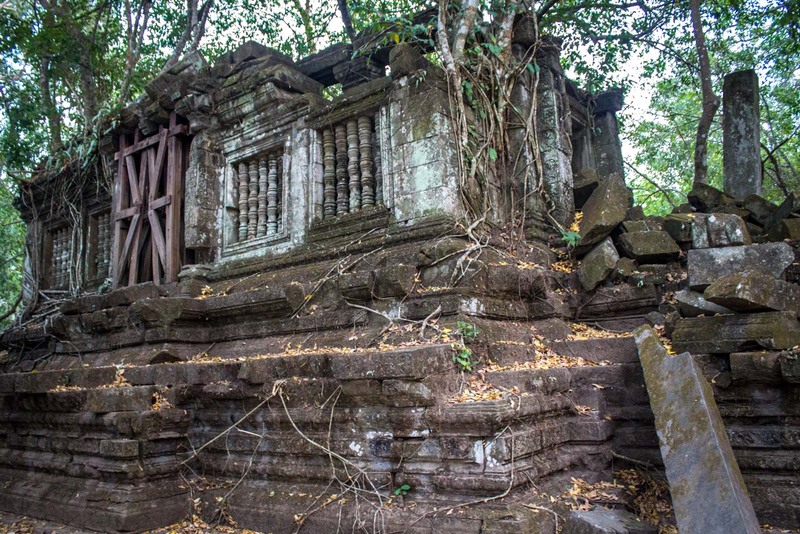 I am going to Camb in Oct ( later to Vietnam) 2015 just have a question who do you recommend to take a day trip or 2 to see BengMealea, kbalSpean temples . Who did you go with ? I went with a guide called San Pak because he also was able to take me to see Preah Vihear (another temple you may want to consider). How marvellous! I was lucky that the temples near Siem Reap were not crowded when I visited but it sounds like that has changed. My husband hasn’t been to Cambodia yet so when we do visit this sounds like a fantastic option! The Angkor temples have got a lot busier over the past 5 years or so. It’s understandable, considering they are one of the greatest ancient sites in the world. but it’s nice to know there are some alternatives from the main ones that are still quite peaceful. That’s beautiful Michael, I really love the way those tree roots have attached themselves to the building, nature claiming back what was once it own !!. A great post and equally telling pics to support the narrative. Cambodia is well known for Hindu Temples and as you know the largest Hindu temple in the world – Angkor Watt – is also located here. Thank you for sharing your experience. A good read indeed. Although they were all built as Hindu temples, most were converted into Buddhist sites at some point. Wow, this looks like something right out one of those jungle expedition movies. Love the photos! It feels just like that too when you’re there! That temple looks almost as crazy as the Calakmul ruins in Mexico. I love it when trees take over. I have been last year to Siem Reap. I love the way you have presented the lovely temple… It’s a cool place, isn’t it? It’s a really cool place. One of the best places you can visit in SE Asia. If you like temples, you could spend a week exploring the sites and still not see everything! I don’t think I’m up to all the scrambling over ruins any more, so thanks for doing it for me! Your photos are fantastic! Oh, you would want to scramble over these ruins I can promise you. It’s a fantastic way to discover a temple – much better than wandering around with a bunch of other tourists! is genuinely nice, every one can without difficulty understand it, Thanks a lot. 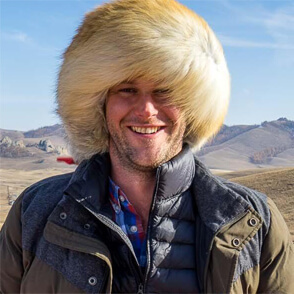 aոԁ found most people will go along with your views on this website. I do trustt all the ideas you have offered tto your post. Heading to SE Asia next month, so excited! Oh great. I’m sure you’ll love it – especially if you get there when there are no other tourists. Let me know what you think!